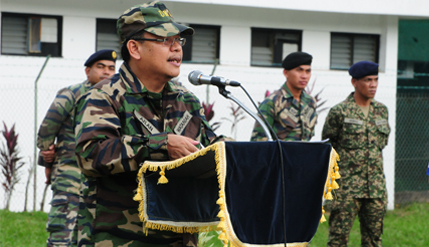 BANGI, 25 Jan 2014 – Members of the Reserve Officers Training Unit (ROTU) of The National University of Malaysia (UKM) have been reminded to uphold three aspects of their training, namely Quality, Training and Discipline when serving the unit. Vice Chancellor, Prof Datuk Dr Noor Azlan Ghazali, as UKM’s ROTU Commandant made the remarks when taking the commandant’s salute at the opening of ROTU training in Dataran Gemilang in the campus here today. Prof Noor Azlan urged the students serving as officers of the unit to always uphold their loyalty in totality to ensure the unit becomes an effective tool for them to uphold military discipline and unity. Unity, he said, requires them as reserve officers of the armed forces to stand strong as a unit guided by a team spirit or esprit-de-corps. It will then become a shield to prevent any attempt to divide them. Prof Noor Azlan advised them to uphold the highest military discipline while exhibiting commendable behaviour at all times. It was also important for them to uphold the core value of excellence which could ensure it becoming a much respected unit. As ROTU officers they also needed to work towards instilling the culture of excellence in their endeavours including their academic studies, honing their skills as well as their personal lives. That would also help them develop a worldview which could broaden their horizons. He was proud to see the part-time soldiers go through the process of transformation as military officers who appreciate the values ​​of training to become future leaders. The ceremony was attended by Head of the UKM ROTU Training and Deputy Commandant, Lt Col Mohd Sahar bin Haji Said. ROTU is assigned under the regiment of the Territorial Army (RAW) which have equal responsibility with the regular full-time army. It is designed to produce officers of the Malaysian Territorial Army, with members who have the privilege of being both in the military as well as civillians or undergraduates.